Xanthorrhoea Australis is a widely distributed species, occurring in Victoria, New South Wales, South Australia, Tasmania and the ACT. The Genus has about 15 species, with a variety of growth habits, some have trunks, others are just grassy tufts. Xanthorrhoeas are often referred to by the common names, Grass-tree and Blackboy. In the Warby Ranges the Xanthorrhoea Australis grows in well-drained soils on the rocky slopes and in the dry sclerophyll forest. The plant is very slow growing and after many years of growth the woody trunk appears. The “leaves” are spreading grassy tufts from the centre of the trunk and the flowering spike comes from the centre of this tuft. The small cream flowers along the spike are nectar sweet attracting many insects and honey eating birds. The Grass trees usually flower from July to December. A threat to the Xanthorrheas in the Warbys is the soil borne disease Phytophora Cinnamomi (a root rot) and they are often the first species to show symptom of the disease and succumb to it. 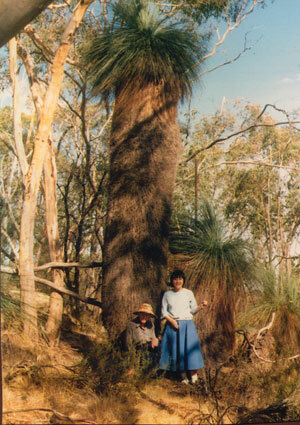 Miss D. Nason and Masako Koshino (Japanese Exchange Student) with 6.70m tall Grass Tree.